I’m tired this morning and I know that I have PLENTY to do at work – a good thing, I suppose. Red had a really hard time going to sleep last night. But despite this, she is still the first one to wake up in the AM. She woke up at 6:20 AM calling for me, and I went to get her and brought her downstairs since it was soon time to get up anyway. She sat in my room and we talked. She saw the empty bowl of ice-cream sitting on my bedstand from last night and she totally caught me. “Hey, what’s that bowl of ice-cream doing over there?!???!?!”. 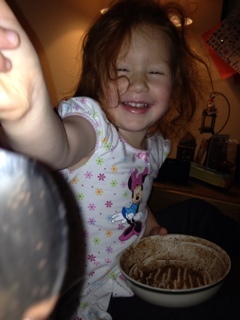 She giggled when I told her that not only did I have ONE bowl of ice-cream last night, but I had TWO bowls….. we were both laughing together at that. I showered while she hung out in my room. Chocolate Tuesday! Kids were loving it. Chocolate Nutella was everywhere. 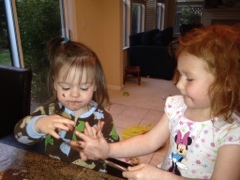 Twin Crazy and Red were sharing a butter knife and picking the chocolate goodness off of the knife together. Big Bro was still sleeping, but when I told him it was Chocolate Tuesday he smiled and said he forgot about that. 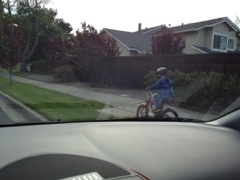 And, he was able to ride his bike today. So, he had lots of good reasons to get up this morning. He agreed and rolled out of bed. I gathered the extra socks that daycare requested. I also made myself instant coffee. I styled my hair and put on make up. I diapered the twins and kissed their faces. I consoled Twin Crazy for something that upset her. I helped Red get dressed. Big Bro was anxious about riding and I kept a careful eye on my watch to let him know when it was OK to get ready. Twin Crazy and Twin Husky had fun in the front seat of the van while we were getting our things together. Twin Husky wanted to sit in Big Bro’s car seat to feel like a big kid so I let him. All drop offs were fine. We were ahead of schedule. So now I’m on the ferry and still a bit tired, and extremely hungry. I’m looking forward to a real big coffee and maybe a chocolate croissant. I love my new office. 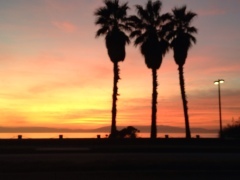 There are so many things nearby – banks, drug stores, lunch spots, people. Activity. Movement. I will have a lot of work to do today but honestly I have 4 hours of back-to-back meetings. How do you get work done when your time is spent like this? And I know that there are to-do’s that will come out of these meetings so that just adds on the work load. Our forums our exactly one month away so this is crunch time. I have 5 presentations to personally prepare for and deliver during these forums, speakers to still secure, speakers to coordinate logistics, presentations to review, and communications to make sure occur between the participants and the presenters. In addition to this, I also have a client project to manage, and the end of the project will occur AT THE SAME TIME. Seems like too much, right? I agree. I am feeling good, I think that putting on nice clothes and having hair and make up done help. I feel like a person. I’m looking over at the ex on the ferry and his eyes are closed. Typical. I’m not missing anything from that relationship. So much about him was so hard to reach. So unknown. So much unsaid. I’m sure he feels but does not express and avoids any kind of conflict. He’d rather just close his eyes and dream it away. Busy! Back in the office which was great! I spent time with outreach to speakers and potential members. Will likely have to do some work this evening. I’m tired, but looking forward to the kids. I hope tonight’s bedtime routine is not as bad as last nights. I picked up Red first, then Twin Crazy and Twin Husky. Twin Husky wanted to sit in Big Bro’s seat. Twin Crazy was crying for her baby, whom she was missing all day today. 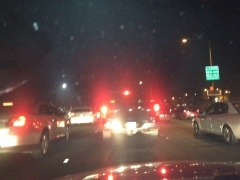 We then went to pick up Big Bro, and then followed him (5 mph, with hazard lights on) along the slow streets to our house. 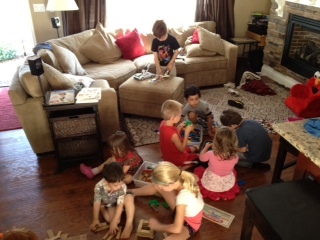 I cooked dinner and the kids were playing really hard together. Lots of laughing and no crying! No-one being mean!!! They were just having a really good time with each other! 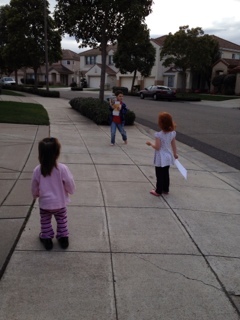 Together we all took a short walk to the mailbox to get the mail. 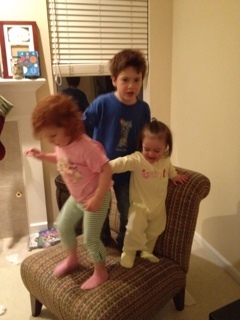 After dinner I did some horsie-back rides with all of the kids; also some airplane rides and flips. I was with Big Bro and Red tonight; we picked out clothes, read our books, and they were in bed by 8 PM. So far Red is not crying. So far so good. I am so tired today. I feel crushed, physically and mentally. I feel like I need to relax but it is almost impossible to do so. Between big work meetings coming up, and things with the divorce, it is extremely hard for me to just decompress and unwind. 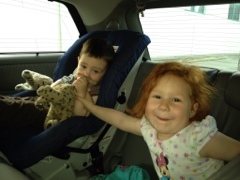 Today was a day of extremes – either the kids were belly laughing or they were screaming in rage. I either felt in control at work or I felt under the gun. And our routine was out of whack because of an early morning conference call. So, I’m glad that the day is almost finished. 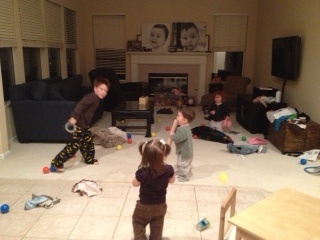 The kids were all up at the same time, and at one point everyone was in Big Bro and Red’s room. The Twins were excited. Red was in a great mood. Big Bro was sluggish. But it was Chocolate Tuesday! I showered quickly and ran downstairs. I was going to take a conference call from home after the kids were already dropped off, and then drive to work — so I didn’t need to do anything with myself in the AM. 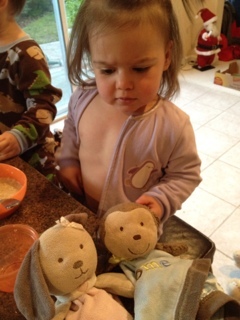 I helped to get the bags ready, clean up the Twins from oatmeal, dress Red, etc. It all happened very quickly and they were all out of there before I knew it. I took a conference call at 8 AM from home. After the call, I quickly got myself ready and drove into the city. I loved my commute to the city this morning. I remember blasting AC/DC — Dirty Deeds, and Highway to Hell. I got pumped up for the day. It felt good to be mobile. It felt good to me listening to this music and at high volume. I had several other conference calls related to the same topic as the call from the morning. Essentially, I am connecting one-on-one with each of the meeting participants to understand from their perspective what worked well, what could have been done differently, and what they want to see out of the next meeting to make that meeting the most valuable to the collective group and to their own organization. Our firm has not done these one-on-one discussions before and they are working out well. It’s also a great way to further and deepen our relationship with these individuals which is always a good thing. I also spent time refining the go-to-market materials for another initiative. I’ll need to reach out to my contacts to describe the change in approach we are taking. I also spent time organizing market interviews for the client project I am working on. We are in deliverable development mode now and I’ve been putting it off. It won’t be hard to do, it’s just hard to start. Once I sit down un-interupted, I should be able to get going on it. I just need the jump-start. This part of my job is always difficult for me – just getting started. Looking at the blank page and knowing that it has to be filled with something intelligent. I spent the rest of the day doing admin items like my timesheet and expenses; and also looking at my workload and hoping that I can become more efficient. Since I drove in this morning, I had to drive back from the city. This is what my commute was like (below). Needless to say, I was late getting back to pick up the kids and thank goodness Hubby made the ferry to start the pick-ups. I picked up Red but he got the rest. We had an “all-orange” dinner tonight. 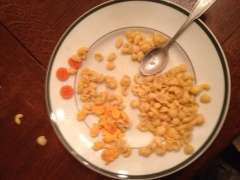 Mac-n-cheese, carrots, and goldfish crackers. The kids thought it was fun. I thought it was easy. I was amazed at the amount of carrots that were consumed. Twin Husky was climbing everywhere after dinner. Moving his little chair around and standing to grab at counters, turn on/off lights. He was also climbing on the dinner table and on the coffee table. We’ve reached that phase where discipline is necessary and stern “No. That’s not OK”. Red wanted to do a puzzle and finish her mac-n-cheese at the kitchen counter. 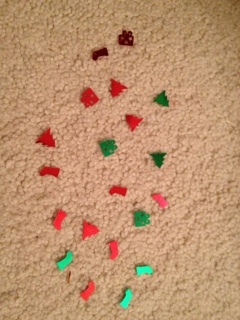 I helped her with the top of the puzzle as I was multi-tasking with other kids. We did the puzzle 3 or 4 times tonight. 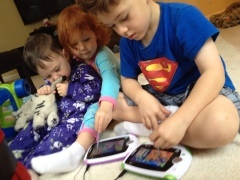 I changed Twin Crazy and Twin Husky in PJs and we had a blast. Kissing bellies and playing games with the clothes and tickling them silly. We were laughing so hard that Big Bro asked us to quiet down. Getting them to bed was so easy. They love brushing their teeth and they ABSOLUTELY LOVE their books. They pick out what they want to read and I love the time with them. They are both so interactive. Twin Husky repeats everything I say. Big Bro was watching a movie and threw a tantrum when we said it was bedtime. It was so bad that I had to sit him down and tell him to stop, and look into my eyes and tell him to stop it and to listen and to walk up the stairs for bed. It was rough. So now I sit here, with my throat hurting from laughter, but my nerves also on edge. Maybe I’ll grab a Guinness. Today we woke up very early, probably due to DST. Twin Husky was singing and woke us up. Twin Husky was singing, along with Twin Crazy, but it was Red who came into our room first. She was talking about the wallet that I helped her make and the pretend money. She was explaining to Hubby that we made a wallet and money together and that Big Bro gave his home-made wallet to Red too, because I had my old wallet up for grabs. So Big Bro is pumped about my old wallet, and Red is thrilled that she has two wallets, one of which is a hand-me-down from Big Bro. I grabbed the Twins from their room. They were busy playing in the cribs, doing dives and jumping and laughing. I changed Twin Crazy since she was soaked through with pee. I need to change the way we do her diapers since now she’s a 100% stomach-sleeper. We’re going through lots of PJs and bedsheets these days. I take a quick shower and then help downstairs with breakfast. Oatmeal is such a hit at hour house that I need to think through a more economical way to do it. We’re going through 4-5 packets of instant per day, between 3 kids. On the weekends I make the homemade stuff which still is fast — the 1 minute cook stuff. And I add brown sugar and butter to make it delicious. I can buy that stuff in bulk at Costco. I want to start doing that during the week too so we can save money and not go through the food so fast. I helped to change Big Bro and Red. Red picked out her clothes the night before which helped. The “carrot” of the childrens’ vitamins after the dressing also helps a bit to get them moving. We were so early today that we all took our drop-offs together. First Red, then Twins, then Big Bro. I’m on the ferry now and this will be my last working day of the week. I will be off Thursday and Friday and am looking forward to the time I will be able to spend with the kids. But, today will be VERY busy for me at work. I think it will take some time to get used to this arrangement — for me, my kids, and my colleagues. I am willing to tweak here and there to make it work for everyone. I am particularly excited about spending more time with the Twins. Time that I never really had with Big Bro and Red. I want to do arts-and-crafts with them. I want to take them to museums. To “sing-a-longs” at the library. To the park. I mostly just want to sit and talk with them. Today at work I will need to work on several proposals — 3 in total. Plus find time to work on my project. Plus find time to close out some loose ends with the meetings that just wrapped up. 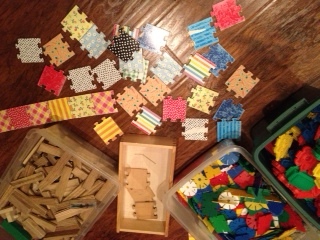 Plus find time to refine our selling materials for our other service offering that we are developing. I will be working back-to-back all day today and hopefully my time will be efficient so I can feel good about taking off the rest of the week. I can’t drop any balls or else this arrangement will likely have to change…. Through my career I’ve learned to use my Outlook calendar religiously. There are blocks of times for meetings, but I also block out time for myself dedicated to specific work that I need to do. And I’m true to those “bookings” of time. If I need to re-arrange, I do – but I never cancel. If someone needs to schedule a meeting, then based on priority I will have them schedule around my calendar, and schedule something on the next day if needed. This system seems to work well for me. I read materials for my client project to get a better understanding of the proposed partnership opportunity we will be evaluating; reached out to subject-matter-experts and secured one interview, and am in process of securing at least 2 others. Primary interviews is research where you actually TALK to the market. You typically can learn SO MUCH MORE than you ever could just surfing the web. You need to be prepared for these discussions though…. you need to have your must-have questions fully organized but still be flexible enough to let the conversations flow – this is where you learn and pick up on other aspects of the business that you may not have otherwise. So I’m excited that we are in process of getting these set up. This was client “billable” time for me. I lead a discussion with another relationship that I cultivated and we proposed for strategy consulting work. It was a great conversation and there are some MINOR modifications to the language of our proposal. They really liked what they saw. The only major thing I have left to do is price the effort – which can be tricky. We bid on fixed price projects but sometimes it is difficult to really estimate the level of effort for the project. I will need to focus on that so we can give him the revised proposal with the price estimate on Monday. This is the first of the proposals that resulted from the meetings I lead earlier last month. Had more discussions with my Directors on my reduced work week. All are in support and we worked on a communication plan so that everyone is aware of my availability, reachability. I AM SO EXCITED FOR THIS. They gave me hugs afterwards. I couldn’t ask for a more supportive firm to work for. I had another business development meeting for a separate proposal we will prepare. I consolidated our list of questions and the Director submitted; the potential client will answer these questions and from here we will be able to craft a compelling proposal. I refined/repositioned marketing materials for one of the initiatives I am leading. I will need to restart outreach to solicit potential members next week with these materials. I met with a consultant who drafted a proposal for a lead that I brought in from another meeting from early last month. This is the 2nd proposal resulting from the meetings I lead earlier last month. I worked with our technology team to get my iPhone set up to receive/send work email. Although I will not be working, if I see anything client-related that is urgent I will respond or forward to a colleague as appropriate. I AM SO EXCITED! I’m on the ferry now, thinking about what I will do with the Twins tomorrow. 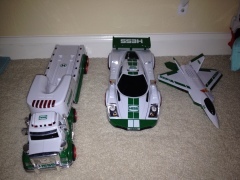 I’m planning on taking all four to the museum on Friday since it is Veteran’s Day and school/daycare is closed. My stress level is washing away from my shoulders and I am looking forward to being a mom to my kids. I picked up Red, then Big Bro, then the Twins. All were in reasonably good moods. Whew! As I made dinner, the kids were all drawing. 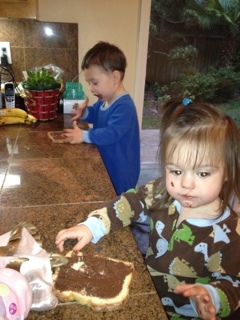 I like giving them projects so that they are entertained as I am busy. Dinner was pasta with sauce on the side. Kids were helping me with the other kids. For example, Red got Big Bro a bowl for his sauce, Big Bro was serving sauce in the bowls, and Red was helping with the Twins. They really do look out for each other which warms my heart so much. After dinner, there was a mad rush of activity around believe it or not, an Amazon box. 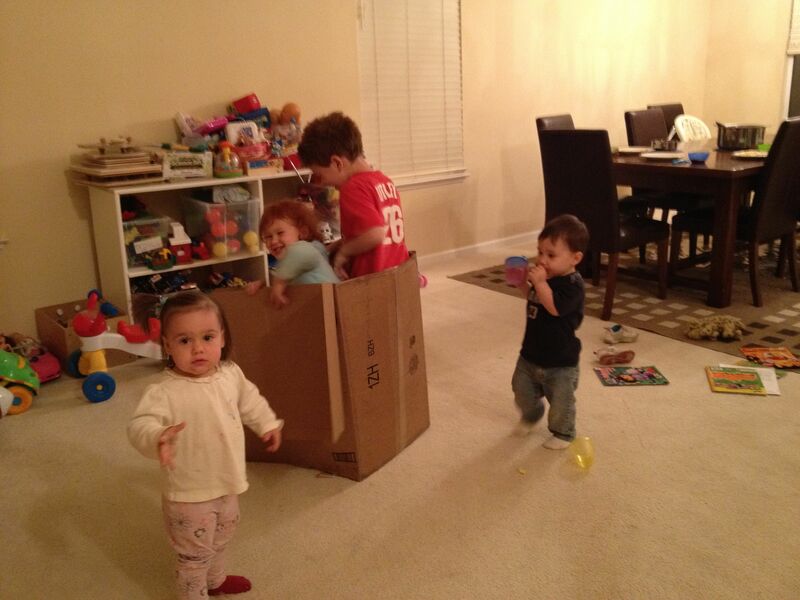 Out of ALL the toys we have in this house, ALL four kids decided that it was the best fun to play inside of this box. 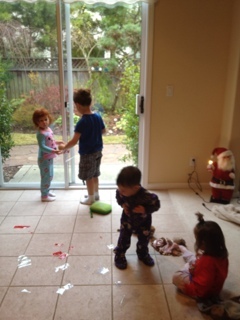 They took turns individually, then as subsets of kids, then even all four of them at the same time. It was hysterical. I then got some chocolate milk for everyone to get them to calm down for the evening. I had a “mommy chocolate milk” (AKA Guinness). I got Big Bro started on his homework and Red started on a picture while I took the Twins upstairs. They are so easy. Then we did Big Bro homework and I helped Red color in some pictures. She is so funny. She draws squares, and then indicates with a dot within each square the ones that she wants me to color. She is so decisive and delegates so easily – tells me exactly what I’m supposed to do. So cute. Everyone is upstairs, I am happy with a Guinness already down, and also looking forward to my day tomorrow with the kids. I’m definitely going to have the Twins – I’m not sure what I feel like doing with Red. I may have her join the fun as well. September 21: Can this REALLY be called working??? OK, so day #2 with no daycare provider for the Twins. 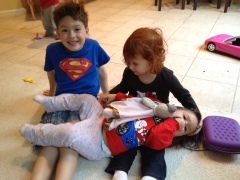 So I am working from home, with two 18 month old Twins…. who are starting…. to fight…. 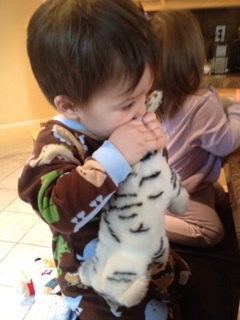 about EVERYTHING….. most often its the toys…. but there is also alot of shoving, pushing, hitting, and BITING. How much work can I really get done on a day like today????!??! I get the Twins. They are cranky. Twin Husky is hot. He demands to be held by Daddy. While I am in the shower, Big Bro decides to give Red a “makeover” with the Barbie make up she received from her Nana last week. So, Big Bro is asking Red which color she wants on her left foot nails, right foot nails, and different colors for her hands. 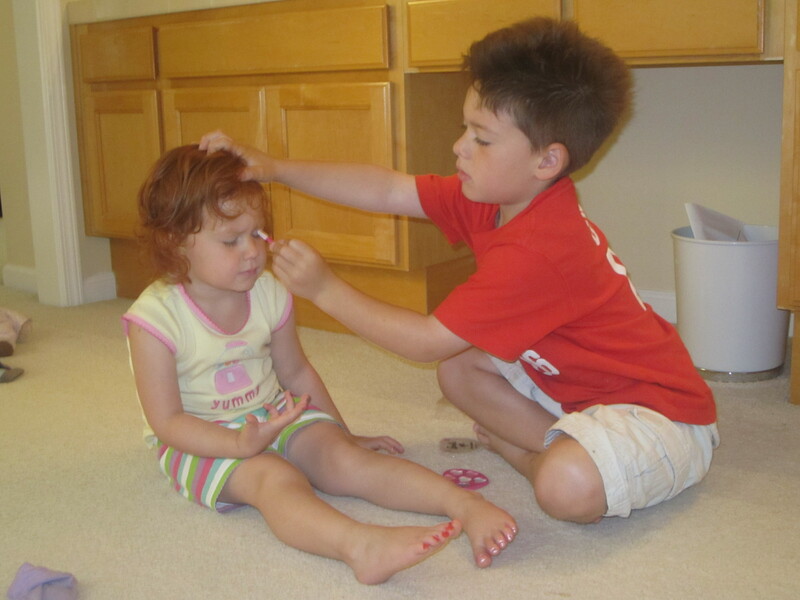 There is also “eyeshadow” that he is applying for her and lip gloss. This is too funny. They are both so interested in the makeup. THankfully Big Bro is not applying anything on himself, but I would be OK with that if so, I think. Kids eat breakfast, lunches get packed. Kids get dressed. We remember vitamins this morning. I spend a lot of time holding Twin Husky. I love the way he feels in my arms. He holds on tight. His head rests on my shoulder. He is big and heavy and sick, but feels wonderful and I don’t want to let him go. 1st drop off: Big Bro. Hubby takes him in while the rest stay in the car. 3rd drop off: Red. We go in together with the Twins. Twins are wearing PJs still, and Twin Crazy is carrying all of her blankets and loveys. It is so cute. The place goes nuts over them. Pit stop: CVS to pick up some stuff. I bring in the Twins. I buy baby Advil for Twin Husky. We head home and I think about what the heck am I going to do for a client conference call at 10 AM???? Make a pot of coffee. Eat leftover kid breakfast. Nuke a Trader Joe’s breakfast for me. Get my computer set up. Twins are playing. Sent out quite a few emails related to all the upcoming forums; I’m trying to get up to speed desperately since these meetings are happening in two weeks time. Kids get a cracker snack. 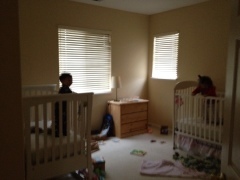 I decide to throw them upstairs in their cribs for a “short nap” at 9:45 so I can be “ON” for the conference call. 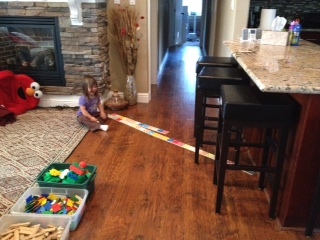 The kids head upstairs and seem OK with this idea. I review the materials I need to walk through for the conference call and think about what I need to talk about – it’s a sales meeting so I have this one shot with them. Upstairs, I hear the Twins laughing and playing. At least they’re not crying. I get stood up for the call. Now I need to reschedule. I hate that. Now it’s extra work for me. I hate having to redo things. It takes time to reschedule and I feel like offloading it to someone but cannot. Ugggh. I do some work while I have a chance and then get the kids. They seem happy. I get them changed into “real clothes” since they’ve been in the same PJs for days. They are adorable. I play with them a bit. Laughing, kissing their bellies. I love this. Snack time is blueberries. 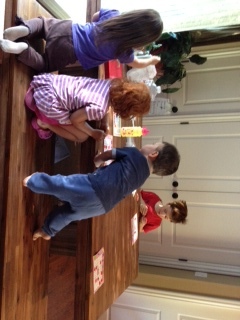 Twins are now able to get to the short table by themselves and sit in the stools. They look so cute. All dressed, and eating their blueberries in their little bowls together. I work while they eat. I also try to secure back up day care for Thursday and Friday — I’m searching through people who applied for the MOther’s Helper position and mentioned they would be available for babysitting or other help. Hopefully someone comes through. We play a bit; run around outside in the backyard. Talk about things. Twin Husky is singing “Happy Birthday” non-stop. 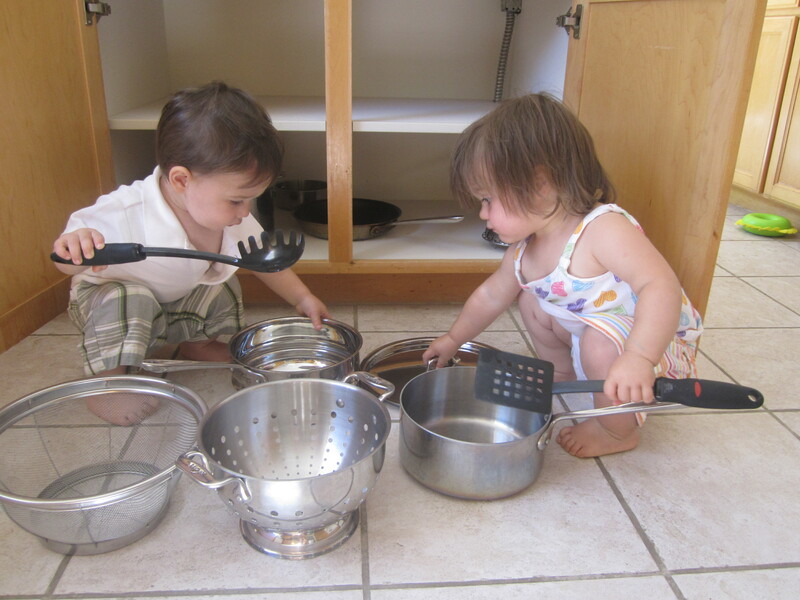 I make lunch while they play with pots and pans. They eat like champs. They head upstairs for bed immediately afterwards. I work while they sleep – coordinate menus, follow-up with guest speakers, follow-up with the analytic team, etc. 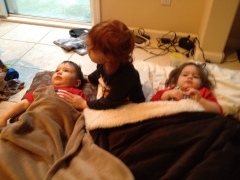 Twins sleep late – they get up and I give them crackers and we pick up Big Bro and then Red. All kids are in a great mood. I am on my own tonight since Hubby has an appointment and our Mother’s Helper took the night off. Kids are well behaved. 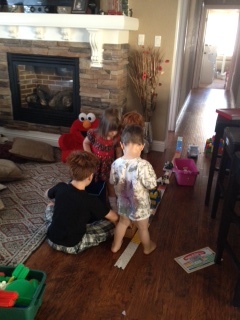 Some playing outside, some inside, Big Bro and Red putting on make up again. Twins are outside with tricycles and scooters. I’m making dinner. Chicken I defrosted is rancid. Plan B: chicken nuggets, broccoli, and side pasta. ALL KIDS EAT LIKE CHAMPS. Even the broccoli!!!!!!! 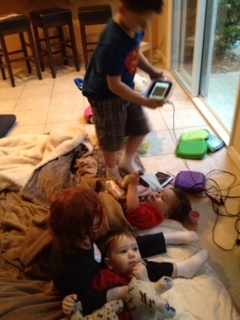 Kids play well while I clean up; I didn’t have much time with them tonight – I feel bad for Big Bro and Red since they are craving mommy time and I didn’t have enough of it to give to them today. Everyone heads upstairs for bed. All kids in one room for PJ changes and songs. Twins go down SOOOOOOOOOOOOOOOOO easily. 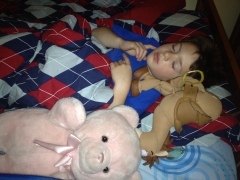 Big Bro a bit harder – he is exhausted despite it being earlier for his bedtime. Red is relatively good until it is time for me to leave the room. She would not let go of my arm and she screamed until Hubby came home to soothe her. After the kids were in bed, I worked for another 2 hours to catch up for today. Now I feel a bit better about the work I managed to do, but I’m still hoping I can find someone to help out tomorrow. I had a wonderful day and feel like I’ve somehow captured the kind of life I want — OK, having someone watch the Twins would have been better, but still. And also having the mothers’ helper would have been good so I could spend some more time with Big Bro and Red. But I’m getting closer!!!! Maybe tomorrow will be Nirvana with day help and night help. And me working from home, dropping off my kids and picking them up, and taking breaks here and there to hug and squeeze my babies. Bliss.